Tomorrow is the last day of our Fall/Winter Sale. Everything not marked ND is 50% off. 1805 Gen. George Patton Dr.
Come shop discount days. All items not mark ND (no discount) will be 25% off tomorrow and 50% off Friday and Saturday. Shop and save more! Did you miss our first drop off? Did you find more items that need to be consigned for Fall/Winter? Second Drop off starts tomorrow. Go here for more info. You pass will be waiting for you when you shop. Tell the worker at the beginning of the line. Remember to Sign Up to Line Up starting at 10am in the morning. The link is on your Presale pass. We hope you find all the great things you are looking for. It is almost time to shop! Consignors will shop Friday at 5pm and their guests will shop at 8pm. Here are a few things to keep in mind as you are getting ready to shop and while you are shopping. Make sure you sign up to line up (you can do this Friday morning starting at 10am, there is a link on your consignor pass). Your pass is only good for you (one person per pass) tell your friend to call/text you when they get in at 8pm with their guest pass. Shoppers who are using the Guest Pass to shop at 8pm DO NOT have to sign up to line up. New this sale - Childcare is available for 5-10pm. $15 for the first child and $5 for each additional child. You can also bring cash to buy snacks at the concession stand. What one item do you hope to find this sale? Leave you answer, along with your first and last name, in the comments. You have until 8pm Thursday night. Your pass will be at the will call box. Check back here in the morning for a skip the line pass giveaway. Also we still have giveaways on Facebook and Twitter before the sale starts. Here are a few pictures of items new moms may want/need. We hope to see lots of new moms Saturday, August 16 at 9am. Be sure you to leave a comment on the Presale Pass giveaway. A winner will be announced tomorrow night at 8pm. Where do you go first when you enter the sale? Leave your answer, along with your first and last name, in the comments. You have until Monday at 8pm. When you check out tell them you are the winner of the $25 gift certificate from the blog. Remember we still have more giveaways before the sale. Check Facebook, Twitter, Instagram and back here for more chances to win. 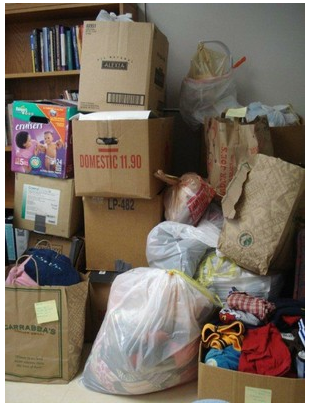 Here are just a few pictures of some of the great items that have already been dropped off. Remember to comment on the $25 Gift Certificate post for a chance to win. You have until 8pm tomorrow (Thursday) night. How long does it take you to get your items ready for drop off? Leave a comment telling how long it takes and don't forget to include your first and last name. You have until Thursday at 8pm. Drop off starts tomorrow and goes through the weekend. You still have time to get your items tagged. Here are the dates and time you can drop off. Appointments are full but you can always check and see if someone canceled. Check for appointment times here. Remember to follow us on Facebook, Twitter and Instagram for giveaways. There will be a $25 gift certificate giveaway here on the blog tomorrow. We've started our giveaways. Make sure you are following us on Facebook, Twitter @encoresconsign and Instagram @encoresconsign, and of course here. We still have times available for you to volunteer. Sign up here and you can shop before the presale. We have NWT boutique items from Coco Bons and others at 70% off retail and LOTS of Gymboree outfits. Working only one shift allows you to shop early. The more you work the earlier you can shop.